Interested in learning more about citizen science initiatives in the field of air quality monitoring? 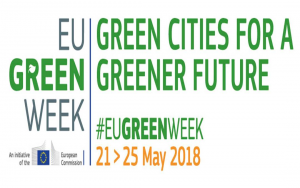 Join our Partner event at the EU Green Week on the 25th of May. The projects Ground Truth 2.0 and iSCAPE, funded by the EU Research and Innovation programme Horizon 2020, in cooperation with the Executive Agency for SMEs (EASME) are organising a Green Week partner event in Brussels on “Involving citizens in air quality monitoring through Citizen Science initiatives”. The event will be an opportunity to learn more about citizen science, citizens’ engagement and environmental monitoring using sensor devices. The citizen observatory Meet Mee Mechelen, initiated by Ground Truth 2.0 in Belgium, will present its approach and results for do-it-yourself air quality mapping. All participants are kindly asked to register here (Eventbrite): https://www.eventbrite.com/e/involving-citizens-in-air-quality-monitoring-tickets-44631895200. NOTE: Participation to the event is free of charge but registration prior to the event is required. For more information please contact: info@iscapeproject.eu. Citizen science activities can be a means to raise awareness, allowing citizens to learn more about their exposure to environmental stressors such as air pollutants, and to take informed decisions which may also facilitate behavioural change. Citizen science activities can also be a tool to mobilise communities, participate in discussions on environmental issues and develop and implement ideas for a greener urban future. In particular, air pollution is a topic of increasing concern of citizens and communities in many European cities. Low-cost sensor technologies which are easy to use can help to provide real-time data and new opportunities to engage citizens in active environmental monitoring. This also raises questions on the reliability of the data and their appropriateness and value for public use. Citizen Science projects and initiatives are encouraged to share their experience and the interested public is invited to learn more about citizen science initiatives and the use and performance of low-cost sensors for monitoring air pollution and personal exposure assessments.